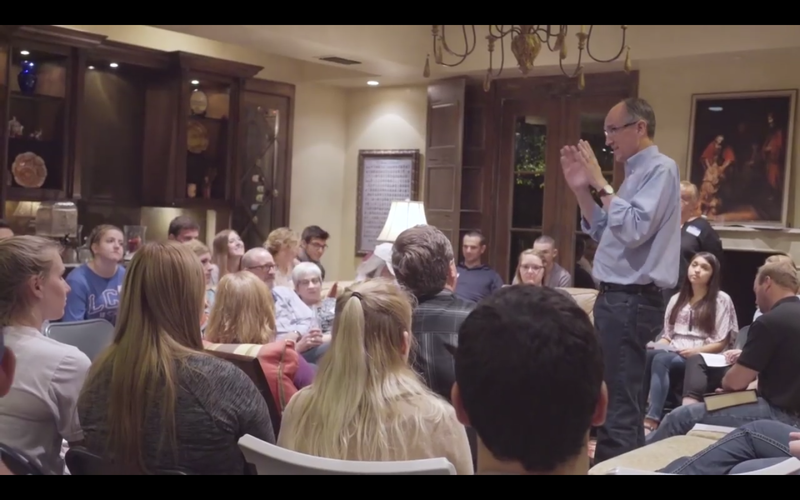 Sunday Night at President Perrin’s, known on campus as SNAPP, is a monthly event at which LCU students can enjoy an evening of dining and fellowship at the president’s house. As a free event open to any student who signs up, it is a great way to meet President Tim Perrin in a casual environment. The meal is followed with a guest speaker, usually an LCU faculty member. If you are interested in attending SNAPP, listen to the announcements in chapel or check the announcements online for the latest updates. The February SNAPP was quite different because it was held on campus at the historic Arnett House. The Arnett house was moved to the LCU campus in 1957 and has served many different functions. It was the first administration building and currently serves as the home for the LCU Associates organization. The speaker for this SNAPP was Dr. Sam Ayers, director of Graduate Education. President Perrin interviewed Dr. Ayers in a series of question and answers that were centered around Dr. Ayer’s career and what led him to teaching. Students who attended the event gave a variety of reasons they like to attend the SNAPP sessions. Kendra Copenhaver, a senior from Lubbock and a regular attendee of SNAPP, said her favorite part is getting to hang out with the president and his wife, Lucy. For more information and a virtual tour of the SNAPP atmosphere, visit https://lcu.edu/admissions/virtual-tour/student-life/snapp/.